PARK RIDGE, ILLINOIS – JULY 20, 2017 — CareGARD Warranty Services, Inc., and its parent company Automotive Financial Group, has contracted with PCMI Corporation to license and implement PCMI’s Policy Claim and Reporting Solutions™ (“PCRS”) platform. PCRS is an administration solution that enhances how Service Contracts, Extended Warranties, and other aftermarket products are sold, serviced, and administered. 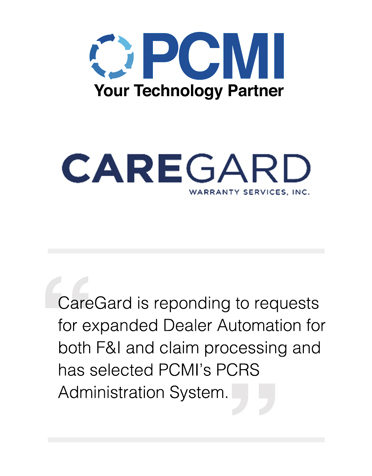 CareGard is responding to requests for expanded Dealer Automation for both F&I and claim processing and has selected PCMI’s PCRS Administration System. CareGARD will be utilizing the Policy Administration, Claim Administration, Risk Management, and Reinsurance modules. About CareGARD Warranty Services, Inc. The Automotive Financial Group was formed in 1994 on the premise of offering superior alternatives to F&I products and business relationships. With extensive experience in the automotive industry, AFG’s founders knew that many improvements needed to occur in the F&I process, agent relationships, product offerings, and administration services if the true value and underlying goals of F&I departments were to be realized. The Automotive Financial Group is 100% committed to their agency distribution network and has the experience and expertise to offer the tools and support which is unmatched in the industry. They are not just another product provider or Insurance company that is trying to understand the retail automotive business. They started in the retail Automotive business and built the program to fit the business. For more information contact: Guy Koenig – President, at GKoenig@afgusa.net or call (817) 552-4169. PCMI provides the technology to automate the administration of Extended Warranties, Service Contracts, Prepaid Maintenance, Theft Prevention and Detection, GAP, and Manufacturer’s Warranty Claims. The company leadership brings decades of policy claim and reporting software technology to the market. Its software supports domestic and international markets for Automotive, Consumer, and Home Extended Warranty providers. For more information contact: Mark Nagelvoort – President & CEO, at mark.nagelvoort@pcmicorp.com or call (847) 653-6916 Ext. 100.